I know, I know, it’s the weekend. 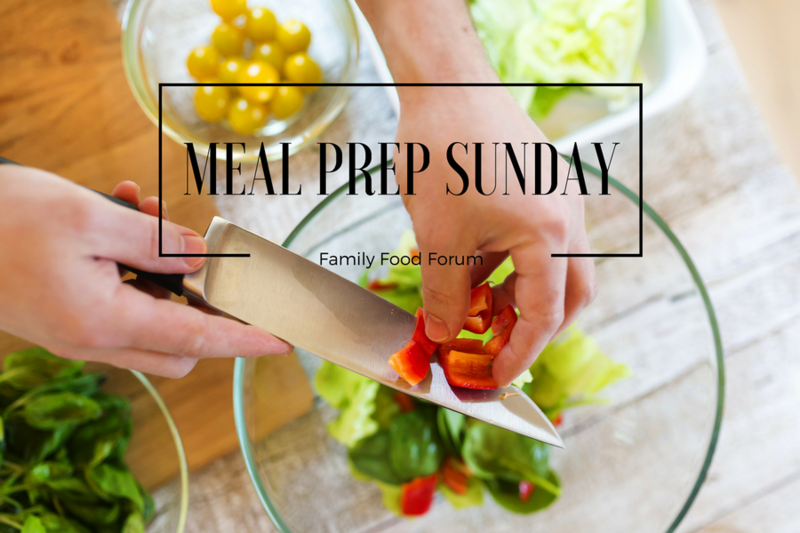 The last thing you probably feel like doing is preparing lots of food for the week ahead. 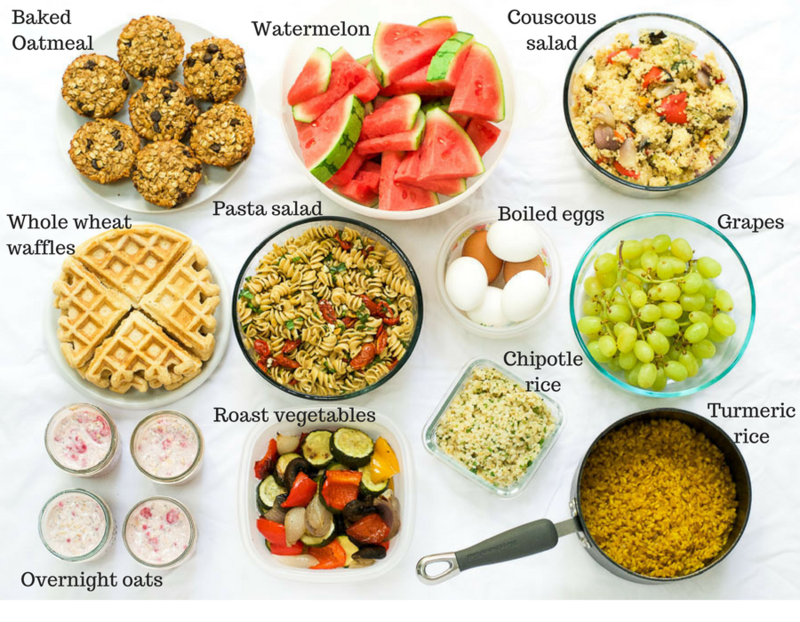 But meal planning and preparation is absolutely key to maintaining a healthy diet. In fact, making time to prepare meals at home is probably one of the most important things you can do for your nutritional health. Research shows that the more time people spend on meal preparation, the more likely they are to eat fruits and vegetables, and the less likely they are to eat fast food or ready-to-eat meals. That all translates to a lower risk of developing chronic disease and better overall health. With that said, you don’t have to spend hours meal prepping every week. Every little helps. If you have 10 minutes to peel and chop some vegetables, wonderful. If you have 20 minutes to prepare some cut fruit, amazing. Whatever you can do to improve your chances of eating healthy food during the week is worth it. Baby steps is all it takes. This is what I managed to make this week. These banana chocolate chip baked oatmeal cups are genius. With oats, banana, eggs, milk, a little maple syrup, and a few chocolate chips, they make a wholesome and filling breakfast that you can grab in an instant. You can keep them in the fridge or the freezer. They are delicious warm or cold, and you can throw them in the children’s lunch boxes for a filling snack. If you want less sugar, just skip the chocolate chips and add some walnuts instead. These healthy whole wheat waffles are a staple in my meal prep regime. They are simple to make, and they freeze like a dream. I break them into individual triangles, place them on a small baking sheet, freeze them, then transfer them to a freezer bag. In the morning, when we are bleary eyed and rushing to get ready for school, we just pop them in the toaster. In 2 minutes you have warm, crispy, healthy waffles. Overnight oats are an absolute winner when it comes to pre-prepared breakfasts. You can whip them up in 5 minutes, and in the morning you have individual portions of deliciously fruity oats ready and waiting. These raspberry chia overnight oats contain more than 30% of your daily fiber and 25% of your daily protein in one serving. Having cut watermelon in the front of our fridge helps to ensure that my children reach for a healthy snack when hunger strikes. Having a vegetable filled pasta salad in the fridge makes it easier to grab a healthy lunch during the week when I’m in a rush. Having a large batch of oven-roasted vegetables in the fridge is an excellent way to prep a number of meals. I put chopped zucchini, bell peppers, mushrooms, red onion, and garlic drizzled in a little olive oil in a 400 degree oven for 35 minutes. I then used the roasted vegetables to make couscous salad, and goats cheese and roast vegetable quesadillas. This couscous salad made with some of the roasted vegetables is another great lunch option for busy weeks. It also makes a wonderful side dish for dinner. Eggs are an excellent source of healthy protein. You can boil them and keep them in the fridge for up to six days. That way they are ready to eat with breakfast or lunch, or as a healthy snack. Washing and preparing fruits and vegetables as soon as you buy them makes it far more likely that they will be eaten before they go bad. That’s why I wash grapes and put them in a clear tupperware at the front of the fridge right after I bring them home from the store. Occasionally we take my daughter to Chipotle restaurant for a treat. At home she often asks for the ‘chipotle rice’, so I do my own version. I simply cook 1 cup of short grain brown rice. Then, when it is cooked, I add 1 tablespoon of butter, the juice of half a lime, 1/4 cup chopped cilantro, and some salt and pepper to taste. I have to admit, it is a tasty way to eat brown rice. This turmeric rice is half of a delicious dish by Naturally Ella. I make the rice in advance, then at dinner time I just have to put together the coconut kale. It cuts down my cooking time tremendously, making a busy weeknight far less hectic. Did you manage to do any meal prep this week? I would love to hear about it in the comments. A wonderful and healthy week ahead!